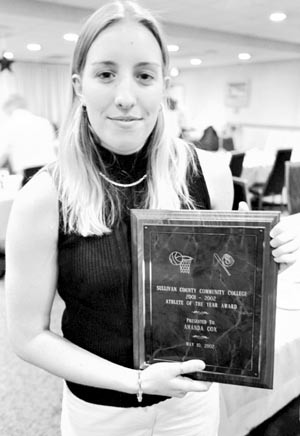 LOCH SHELDRAKE  May 21, 2002  The folks at Sullivan County Community College (SCCC) think the annual athletic awards banquet is more than just a great meal. Amanda Cox, an alumna of Livingston Manor Central School, was tabbed as SCCCs Female Athlete of the Year for the second consecutive season. Cox has a 3.4 g.p.a. in environmental science, and was recently named the outstanding second-year student in the environmental science program. She has served on academic search committees and as a staff member during the last two Region XV tournaments at SCCC, keeping the official scorebook for all games. In her first year at SCCC, Cox averaged 16 points, four rebounds and five assists per game on the basketball court. And she was the number one threat opposing coaches worried about when playing Sullivan, Walter added. In the 2001 softball season, she had a .570 batting average in addition to playing a solid shortstop. During the 2001-2002 hoop season, Cox averaged 18.6 points, six rebounds and four assists per game. Davon Wilson, a 21-year-old sophomore from White Plains was selected as SCCCs Male Athlete of the Year. According to Beeten, the decision to pick Wilson as the top male athlete was an easy one. He defines exactly what it is to be a student-athlete, Beeten explained. He excelled in the classroom and on the basketball court during the 2001-2002 school year. Wilson, who has a 2.7 g.p.a. in sports management, averaged 12.6 points and four assists per game this past season. Its great, he said of receiving the award. I worked hard this year, and tried to do this for my mother. After the plaques had been presented to Cox and Wilson, DePew had a few words to say about the SCCC Athletes of the Year. Amanda is the best female athlete that ever came to Sullivan, DePew said. And Davon is the epitome of what you look for in a student-athlete. He was the kid that never gave you any lip when you were yelling at him for making a mistake, and he stepped in and did the job when we got a little thin up front. Several other awards were presented at the banquet to deserving SCCC student-athletes. Those who earned conference and/or region accolades were also recognized.  Mens Basketball: MVP  Shiron Brown and Tim Butler; Most Improved  Wygene McCants; Coachs Award  Dana Holmes.  Womens Basketball: MVP  Amanda Cox; Most Improved  Nicole Feller; Coachs Award  Carly Sklar.  Golf: MVP  Gregg Semenetz; Most Improved  Erinn Raush; Coachs Award  Scott Herman.  Volleyball: MVP  Patricia Tate; Most Improved  Smathe Menier; Coachs Award  Debra Swan.  Cross-Country: MVP  John Peters.  Mens Basketball: Shiron Brown and Davon Wilson.  Womens Basketball: Amanda Cox.  Mens Basketball: Tim Butler.  Womens Basketball: Nicole Feller and Rachelle Irwin.  Volleyball: Smathe Menier and LaTasha Wheeler.  Volleyball: Tiffany Barotti, Bronwyn Flewellen, Wendy Diaz, Tracy Denman and Donna Funceon.  Mens Basketball: Dana Holmes and Bryon Evans.  Womens Basketball: Amanda Cox, Nicole Feller and Rachelle Irwin.  Mens Basketball: Tim Butler and Shiron Brown.  Mens Basketball: Shiron Brown.